The last day for team members to wake up in Asia has arrived. Beginning with Dan's quick departure almost straight from Lukla for Bangkok and on to Los Angeles on the 17th, we have all been leaving Nepal for home as our scheduled flights from Kathmandu depart. Great memories of life along the trail to Everest Base Camp and the satisfaction of having completed a journey that was far more than any of us could have expected it to be have left us all in a great frame of mind to enjoy the amenities of modern Kathmandu. "Traffic" here in Nepal's capital is narrow streets clogged with noisy, honking cars, not lines of yaks moving along mountain trails as we had known for much of the trip. But the guys do great walking confusing crowded streets on their way to Thamel, the trekker’s district of town with hundreds of restaurants, bakeries and gear stores. It is nice to know that when it gets to be too much you can work your way back to the peace and quite of our hotel, the Yak and Yeti. 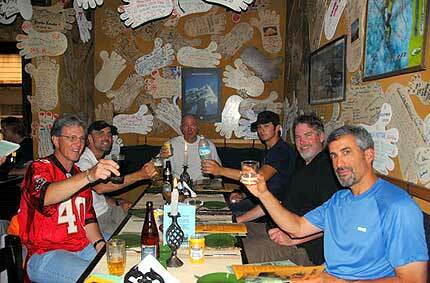 Our dinner at the Rum Doodle Bar, with signatures of decades of climbers and adventurers hung on the walls all around us was an enjoyable time. I will have to say this crew cleans up pretty good! Most of them took advantage of a Nepali style shave, haircut and head massage from a local barber soon after arriving back in town. As Ang Temba, Min and the office staff collect us, present our final Khata blessing scarves, and take us to the airport we are all commenting, often with a tear in the eye, about what an exceptionally compatible group of friends we have become during these weeks spent in the shadow of Mount Everest. In some ways it went very quickly, yet in other ways our days here in Nepal were so long and full of new and wonderful experiences that it seems we have spent a lifetime together walking those dusty, colorful trails. We will never forget the people along the way, the mountains and one another.